Nebraska farm family creates picturesque homeplace centered on pork. The O’Neel hog farm in Friend, Nebraska, is a family operation. From left: Ethan and Kayla O’Neel, Terry and Diane O’Neel, and Danielle O’Neel and her fiancé Sam Pendleton. Fourth-generation farmer Terry O’Neel remembers spending many of his high school days helping his dad tend to 100 beef cattle and 50 dairy cattle on their family’s southeast Nebraska farm near the town of Friend. After studying animal science at the University of Nebraska, Terry married his wife, Diane – who also grew up farming – in 1984, and the couple returned to Friend to build their own family farm. The family also grows corn, soybeans and alfalfa. The O’Neels raised two children on their farm. Both are in their late 20s. Their daughter, Danielle O’Neel, works in human resources for Smithfield in Crete, a pork processing plant. And their son, Ethan, lives with his wife, Kayla, on the farm. Ethan works with the crops and pigs. The O’Neels also employ a married couple, Jess and Dustin Payne, who live on the farm with their two young sons, Gannon and Boone. This past summer, the O’Neels hosted Kai Meierzuherde, an intern from Germany who lived and worked on the farm as well. Diane handles the farm’s record keeping and finances, and she also works off the farm for the Farm Service Agency. In addition to record keeping, Diane helps mow the farmyard, runs errands for parts and also goes to the vet on her way home from work. Terry’s typical day starts at 7 a.m. and may include tasks such as weaning young pigs, vaccinating pigs, or loading them onto a semi and driving them to market. The O’Neel family cares about how they treat their animals. “A healthy, happy animal is one that provides us with our way of living. It’s frustrating to see videos of animal cruelty, because it’s not in our DNA as farmers to mistreat animals. It’s disheartening that some people today are so removed from agriculture that they don’t understand why or how we do things,” Terry says. That’s why the O’Neels allow guests to tour their farm. From the beginning, the O’Neels paid close attention to making sure their farm practices were environmentally sound, and they take pride in how their property looks. Over the years, they’ve planted more than 1,600 trees, keeping the farm well-landscaped with flowerbeds and neatly trimmed grass. A horse and an employee’s calves graze the steep banks of their lagoon, eliminating a difficult mowing chore. In 2008, the O’Neels received the National Pork Board’s Environmental Stewards Award, which recognizes producers who show a strong commitment to protecting the environment while promoting the well-being of people and pigs. Diane adds that one of the challenges the family and other farms must meet is helping educate consumers about farming practices and way of life. Other challenges include high input costs of farming and misunderstandings about GMOs, or genetically modified organisms. Despite the challenges, farming certainly has its rewards. For Terry, living and working outdoors in wide-open spaces are the best rewards. 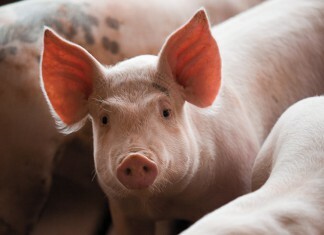 Nebraska row crop farmers add value to their family farms by diversifying into raising hogs.